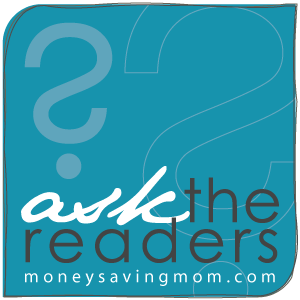 Ask The Readers: Quick, easy, budget-friendly school lunch ideas? My kids’ school has bumped hot lunches up to $4.10 this year! While I usually pack lunches, there’s no way my kids will get the option for one school lunch per week at these prices. 1. How much do you usually spend on the ingredients for cold lunches? $4.10 for a school lunch? Are you joking me? I about lost it when our school raised lunches to $2.15 this year. Do they serve steak? Is this a private school? What part of the country do you live in? Will they have a microwave to heat up leftovers? School lunches are NOT created equally–you get what you pay for. Or at least I hope so in this case! We live in a fairly wealthy area and our lunches are $1.85 . . . and disgusting. It’s all easy kid food (pizza once, sometimes twice a week, burgers twice) almost entirely processed courtesy of Sysco (the company that also feeds convicts–except they get more protein). Fruit and vegetables are rarely fresh and no effort is made to prepare them in a way to encourage children to actually try them, so most are tossed–except the canned fruit swimming in syrup. Sigh. Meanwhile, there are schools that offer mesclun salad greens. I’d be happy to pay more for a reasonable, not-so-processed meal. The meals are no better than those I had, living in a rural, much lower-income area. I don’t understand that. My 1st grader is picky, a slow eater and her lunch time is 11-1115am at school. — she won’t eat any fruit. At all. Last year I’d send a yogurt in a tube and it would come back home, so not wasting my money on those again. She also won’t eat raw veggies. She won’t eat salad, or wraps, etc, etc, etc. So those 3 things are about all she will realistically eat. Sometimes I add a granola bar or a homemade cookie. I also send a bottle of water. My daughter won’t eat smoothies. She won’t eat the cake part of cupcakes or cake. she licks of the frosting and throws away the rest. I have tried hiding veggies in my homemade spaghetti sauce and her taste detector goes off and she won’t eat it. She ate all those things as a baby, up through age 3 or so. And I ate them while pregnant and nursing, so she was exposed to all the flavors. My DH is also very picky, whereas I will eat just about anything so long as it is not raw meat/fish and doesn’t have mayo on it! Jessica – You may want to get the book “French kids eat everything”. I think it may help with your picky eater situation! My son had lots of trouble trying new things and eating a variety at age three, too. Must be that age. But if he wanted dessert, he had to eat his dinner. It seemed like an entire year of tantrums at mealtime–and this from an otherwise easygoing kid. I swear he didn’t eat dinner that entire year! At some point, his desire for “dessert” (even just a small piece of candy or something sweet) overcame his stubbornness (and that’s what it was, because he was refusing dishes without tasting and refusing dishes that he should have enjoyed otherwise). He is an incredible eater now–he will eat anything. The other day, we had homemade creamed spinach, which I know he does not like. After he tasted it, I told him he did not have to eat the rest, and he could have dessert anyway. He didn’t like it, but he ate the rest! Now I have a picky two year old, and I’m dreading those threes! She’s so much savvier than my son was. She “stockpiles” meals she likes in order to sit out those that she doesn’t. It’s been a tough, loud year, and the next will be no different, but I have no doubts that she will become a reasonable eater. It is hard work, though. One thing I noticed is that kids don’t try new things (or give new foods a chance) when they aren’t hungry. We are such a snacky society. Mealtimes will be easier if your daughter is hungry at mealtimes. Cut out snacks and don’t let her fill up on the three things she likes to eat. Give her a reasonable portion and if she’s still hungry, try the other foods. I promise even the most stubborn child won’t starve! She doesn’t get snacks. And no dessert if she doesn’t eat dinner. She also is only given milk or water to drink. No pop or juice. Yesterday for example: She got up and drank her milk. Went to school and “forgot” to stop by the cafeteria for breakfast (our district provides free breakfast to all students). At lunch time, instead of eating the cheese and crackers I sent, she destroyed the crackers into a million crumbs and squeezed the cheese in the bag until it melted into a glob. She brought it home this way. At dinner, we had turkey, macaroni & cheese and broccoli. She stared at it and it took her 1 hour 45 minutes to eat. It was all food she likes. It took her so long that she missed calls from both sets of grandparents to inquire about her first day of first grade. Also she missed dessert because it was 7pm by the time she got done eating, and bedtime is 8pm. I know those marathon two-hour dinners all too well, though mine are usually my son doggedly eating a meal he doesn’t like in order to get to dessert. We’ve had to put a time limit on dinner when it starts dragging out. Hang in there! Oh, Jessica! I’m so sorry you are dealing with this! Have you tried consulting with a nutritionist? There’s one in my neighborhood who is fabulous. My niece has had a lot of eating issues due to a super sensitivity to taste and texture. I know the nutritionist was really able to provide some concrete help for her! Getting her involved in the process and finding things she likes to eat that will fuel her body, and not making food a battle ground is easier said than done…but praying that you can find a way to help her through this picky season! I know, some kids are just picky and they grow out of it. Others really do have some medical issues that can make life really frustrating! You can do everything right and still have everything go wrong. Thanks so much for mentioning using a nutritionist! I am an Registered Dietitian but I don’t work with kids. The Registered Dietitians that work with kids are AMAZING in their knowledge though. Find someone that specializes in kids. Also read any book by Ellyn Satter. She is a dietitian and eating therapist. Very good info. I feel your pain – some kids are VERY picky and other are not! I have two very picky eaters and one great eater. I have done nothing different in eating habits. They just have different personalities and tastes. My husband (who is a physician) says kids will eat when they are hungry (on a side note all my kids are healthy and growing – some kids struggle and I know he would not say that with kids who fail to thrive). On another note, I do put lots of different foods in front of them and require them to take one bite of each food, but after that we allow them to get up from the table with an understanding that no more food will be served until the next meal. Don’t beat yourself up. When it comes to kids, you have to give yourself and them TONS of grace! Sounds like you would do anything for your daughter – if you keep loving her like that, SHE WILL THRIVE! Block Cheese cut up with crackers is a favorite of my son. It only takes a minute to cut it up. Throw in a banana and some carrot sticks and you have a healthy lunch. I don’t know what I spend specifically on just lunch stuff because it’s included in our grocery budget. My kids choices are a sandwich (any kind), a wrap, or corn dog muffins. They also like the Chef Boyardee mac and cheese cold (ew) so I let them have that every once in a while. After they’ve picked their main food, they have to choose either a fruit or a vegetable. I try to always have at least 2 of each to choose from, but sometimes that doesn’t happen. I don’t want to fight with them to have to pick one of each, plus they can’t eat that much food and I don’t want things to go to waste. After that, they pick some chips or pretzels, that we put in the sandwich bags ourselves (whatever chips were on sale) and then one treat. The treats are whatever I can find on sale for a good deal…fruit snacks, granola bars etc or homemade cookies if there are any that day. Sometimes there isn’t anything for a treat if I haven’t found anything on sale…then they get more fruits and veggies. I also bought them reusable water bottles so they take a water bottle with them every day. So I just make sure to always have sandwich fixings, fruits and veggies, chips and treats if I can find them. Both my teen and my elementary school student love tacos for lunch. I just make the taco meat ahead of time and them heat it up quickly in the morning and put it in a thermos. It’s then easy to pack 1 or 2 tortillas and some cut up lettuce and cheese. Another favorite of theirs is mac and cheese also in the thermos and believe it or not bagels with cream cheese. Other fun and fast lunch ideas are chicken, broccoli and rice casserole heated up in the morning from leftovers, nut butter of any kind and banana sandwiches, and cold pizza. what kind of thermo do you use – I have tried a few and the food is always cold by the time they need to eat it? Please be careful with the rice. If it isn’t kept hot properly or improperly cooled down even to just a warm temperature (sp) it can be quite dangerous to eat. It can cause paralysis and even death. I have never heard of rice causing this problem before and have eaten it warm many times. Absolutely. Uncooked rice can contain spores of a bacteria that causes food poisoning, which can survive cooking. If left at room temperature, they can multiply and cause food poisoning. Reheating won’t kill them, either. Best practice dictates refrigerating cooked rice immediately, reheating no more than once, and keeping in the fridge no longer than a day. I don’t really worry about it, but I do take care to refrigerate my rice shortly after cooking. I taught 2nd grade and our students ate in the classroom. The students who brought their food in thermos seemed to eat more than those with sandwiches. Or maybe it’s because I just didn’t see that waste in our garbage cans! I heard if you put hot or boiling water in the thermos before adding the leftovers in the morning they stay warmer longer. I agree thermos meals are the way to go. We have a 14, 12, and 9 year old they love the flexibility. I love that leftovers go to each person who had a favorite served. Ham and cheese tri color rotini is a favorite and I make that often just for the three lunches plus my husband. Bread rolled flat with a rolling pin and filled with pinwheel ingredients is popular. Also we use tortillas to fill with mostly Mexican fillings and I toast the sides on the griddle. Good luck. Best tip ask your kids to help make a list of thirty items they want to see in their lunches this year. Yes there is some junk on the list but one of ours put hummus on the list another said pretzels and mustard. Their friends bring different food they may have tried something they liked. I too pack lunches for my kids. I have full on planned ahead this year. My son doesn’t mind eating room temp lunches that are suppose to be hot. He prefers this I’ve a cold sand which any day! In my freezer I have corn dog muffins. Jiff corn muffin mix made per box instructions … In a muffin tin fill 1/2 way with mix place 1/2 hotdog in and then cover with a little more mix. Bake at package directions. When cool place in freezer bag. In morning I throw 2-3 in microwave for 1.5-2 min and put in sandwich keeper. He likes ketchup so I have little side containers for that. We also do breakfast for lunch. A few small pancakes and syrup with yogurt and berries. Breakfast burritos. Or French toast sticks. All of this I have made and placed in the freezer for quick breakfast or lunch! He will also eat cold (room temp) pizza. Soup in a thermos, cut up veggies, fruit salad, celery w/ peanut butter and raisins, leftovers from dinner (some things are fine cold! ), crackers with cheese and salami, peanut butter crackers… those were some of my favorites! A few options: a sandwich in the big section, cut up fruit or veggies in the medium section, and trail mix or pretzels in the small section. Leftover cold pizza is a big hit. Probably their favorite lunch is leftover soup in a thermos. I throw in a baggie of whole grain crackers and a piece of fruit, and they’re happy! Another time saver that I learned from Money Saving Mom is the make-ahead peanut butter and jelly sandwiches. (Or sunbutter, if allergies are an issue.) I make a big stack of those and use my fun pampered chef press and seal and keep them in individual baggies in the freezer. On days when I am out of time or just need a break, I grab one or two of those, fruit and a treat and call it good! My older boys are great lunch packers, so I have them do most of theirs the night before, and just finish it up in the morning. My boys all prefer to drink water, since the milk they can buy is “warm-ish.” So, they all pack icy water bottles. I try to make big batches of cookies and freeze them for treats. We don’t do treats every day. I try to keep the lunches simple and nutrient dense…they don’t have much time to eat! My youngest told me that, for him, 3 things in his lunch was perfect. Anything more than that was overwhelming. I was just thinking this morning how much fun I had packing their lunches…but I know by the end of the school year, I’ll be SO OVER IT! Good luck!! You can do this!!! Do you just put the frozen cookies in the lunch box, or do you thaw them first? I put frozen cookies straight in the lunch box. They thaw quickly. Just put them in the lunchbox frozen…they’re thawed by lunchtime! Same thing with sandwiches. If you put a frozen one in, it will be perfect at lunch! I freeze practically their whole lunch– I make sandwiches, homemade pizza rolls (like cinnamon rolls), cookies, muffins, breads, yogurts, applesauce in my own little containers, etc….. just pull it all out- thaws by lunch but I usually make the night before so it’s definitely thawed for the next day. Having it in all in the freezer helps so much! They help me pack too- I made up a little little chart: carb + protein, fruit, veggie, treat with examples of each-they pick from each category. Helps a lot. When you freeze their lunch and pack it the night before, do you store it in the fridge or on the counter? Incidentally, frozen cookies are awesome! In college, my roomate’s father baked her bag after bag of chocolate chip cookies that she kept in the freezer. We got in the habit of eating them cold and they were so good that way! Sarah, I just wanted to say I love you for saying you don’t need the cutesy ideas on Pinterest but the quick and practical ones! I’m always open to ideas. My son loves a good ol’ apple in his lunch ($4 for a 3-lb bag that lasts my family of 4 a week) while my daughter prefers those squeezy applesauce pouches. I only buy those when on sale (right now I’m buying Go go squeez at Walmart, 4 for $2). Pudding cups were a big hit for a few years and they are affordable (4 for $1). Good luck! As to a budget: I shoot for $2-$3/meal per person in our house for lunch (Minneapolis, Minnesota area). It’s scary how expensive food has gotten, yes? I would also say (for us) that healthier choices trumps cost at some point…..and you don’t want to give them so much that they don’t eat dinner, either, lol. My Mom raised us to think of the big red bowl of raw fruit and veggies as “free” for us to access anytime—-I like that idea as well, and it’s not too costly if you buy what’s in season. Veggies: carrots, broccoli, cucumbers, cherry tomatoes. I make a homemade veggie dip and will send that along too if I have some made. Beverages: milk or water, usually. Today’s lunch was a pb & j sandwich, grapes, a granola bar and water. Watch the sales for great deals. My kids love berries and melon, so we do that a lot in the spring and summer. A slice of meat and cheese on King’s Hawaiian bread can be a bargain around the holidays. I’m sure I’m forgetting several of my best ideas, but there is a place to start! I also have a very picky eater. She has one of two things in her lunch every day. Either a peanut butter sandwich (no jelly) or a balogna sandwich. Then a fruit (usually a natural applesauce cup I buy on sale, but sometimes grapes, cut up strawberries, or cantaloupe) a “Simply Gogurt” tube (I freeze them and they thaw in her lunchbox and keep everything cold–I buy a bunch of boxes when I can pair a sale and coupon and freeze the boxes), and a cheese stick (string cheese). I used to send water but she didn’t drink it, so I stopped. I’d love to come up with new ideas, but she likes so little and is happy with those choices, so I will stick with it for now, unless she starts complaining. I always try to send a serving each of veggie, fruit, protien, bread, and or muffin, wrap. Here are some favorites at our house and if you like to bake you can freeze homemade muffins, cookies, bars, and put in the freezer. Whole wheat wraps with cheese and turkey or ham, bagels w/butter, jam, pb, etc (I buy them at the discount bread store & freeze) Soup in a thermos, yogurt (I buy a larger container and put in smaller containers for them) Pita bread with favorite fixings too. Make it fun and involve them too, and avoid the expensive prepackaged items and I buy the lunch stuff when I get groceries and try to use coupons too. I try to stock up on crackers, pretzels, when on sale. It probably is around $10.00 a week ….hope this helps! Last year I bought the containers from easylunchboxes.com. Love it. With three kids in school I was using a lot of ziplocs, and so I figured that the containers paid for themselves by the end of the year. And now I’m still using them for a second year. Saving on bags is nice, but mostly I like them because it makes it easier to pack a better lunch. It’s easy to toss in a little of this and that, whereas in the past I wouldn’t have wanted to waste a bag on just a few almonds, for example. There is a link to a blog on that website that has hundreds of reader-submitted lunch ideas. Sometimes I do use a Thermos for hot foods instead. Leftover soups, etc. Pour boiling water in the Thermos for about 5 minutes in the morning before putting the hot food in, and it will stay hot longer. Love the idea of heating the thermos before! I feel your pain. My daughter’s hot lunch is $3.50 and not at all impressive. Our compromise is that she gets hot lunch 2 days/week and I pack 3 days/week. I use a Laptop Lunchbox for her that has 4 compartments. She gets: 1) fruit, 2) veg, 3) entree (usually leftovers from previous night’s dinner), and 4) small dessert. And a juicebox. I’ll do a thermos of soup or noodles every so often. Sandwich, fruit/apple sauce, cheese stick, fruit snacks, crackers or cookies and a bottle of water. My kids’ lunches are pretty simple-sandwich, piece of fruit, one prepackaged treat, and a bottle of water. My big suggestion? Have the kids pack them themselves! Kids won’t pack things they aren’t going to eat, and I find kids are less picky if they have to make it themselves. Even a small child can handle making a sandwich and putting a few things in the lunch box. You might also see if you qualify for reduced lunch pricing. my kids like leftover cold pizza. I will plan ahead to have leftovers and individually wrap them. some may not like the idea of it being served cold, but my kids like it. I have never packed for kids as we home schooled but I have packed for my husband for 35 years. One thing I did not see here in the comments was homemade muffins. I keep my freezer stocked with healthy muffins and put one in with lunch everyday. They are made with whole wheat flour and light on sugar so they are a filling choice for the sweet item. I always keep a watch for great deals on good quality lunch meats and keep plenty on hand. An easy way to vary sandwiches is to change the bread. I bake all the loaf bread that we eat but it is a nice change to have an onion roll or kaiser, etc. once in a while. My WalMart had washable reusable Igloo sandwich bags for 1.96 on the back to school isle. I am loving those. We are trying to not use throw away items because they are just money down the drain. Yes! I just got a gallon sized reusable bag at Target for–yikes!–$5, but I love it! It has been in use nonstop since I got it! I have boxes upon boxes of nearly free disposables, but they seem so wasteful (yes, yes, it is wasteful to buy and not use them!) but they are on my kids’ back to school lists, so I’ll just send them there. I will look for these cheaper reusables at Walmart. Thanks for the tip! I had no idea there was a gallon size reusable available! Thanks for letting me know about that! I do still have disposables because sometimes we do need them but we were throwing so many away everyday that it was just starting to irritate me. Yeah, I often use disposable bags for “clean” foods (bread, veggies) and I hate to toss them when I’m done. I hope to gradually buy enough reusable bags for those types of items and use disposable only when something is messy or convenience is key. The brand name of the bags I found are Blue Avocado, and they only seem to be in Targets that have a produce section (expanded grocery–not necessarily a SuperTarget). They sell two products: a single gallon bag (http://www.reuseit.com/reusable-sandwich-and-snack-bags/blueavocado-blueavocado-rezip-reusable-bulk-storage-bag.htm) or a combo pack with a quart size bag and smaller snack size bag. The latter is $5-$6, can’t remember which. HTH! My kids love cheese and crackers with a few pieces of lunch meat. Basically we make our own lunchables. The cheese is what ever is on sale that week. We also put in a healthy snack like apple sauce or yogurt and then a sweet treat like fruit snacks or a granola bar. All these items I have picked up on sale. A mom packed lunch usually costs me about 30-50 cents. Muffins!.. you can make them savory with meat, bacon and veggies etc. or sweet with fruits and oatmeal etc. Its easy to make 12 at a time, freeze, and take one out in the morning or the night before, add yogurt or cut up fruit and veggies to the lunch box and you are set. Check out any smaller stores for deals. This year for my high schooler, I have been packing a full size hoagie every day with a bottle of tap water. I saw a local meat market has a ‘sandwich stuffer’ deal for $9.99. It is 6 large sub rolls and 3 or 4lbs of deli meat (a variety) and swiss cheese. It comes out to $2 a day, but now that he is older pbjs weren’t filling him up. He doesn’t even snack after school bc he is so full. For any people in Ft. Lauderdale, FL, this deal is at Penn Dutch. That is more than what I spend to feed my entire family of 9 for a day’s meals (3 meals plus a snack). Food costs have really increased. That’s quite a jump! There are some really fabulous lunch containers out there that you can use for things like fresh fruits and vegetables in season, dips (made with Greek yogurt or beans for variety and nutrition, as well as to keep the cost down), homemade mini muffins or regular-sized muffins, homemade crackers, applesauce, raisins, etc. A good insulated water bottle will mean cold water at lunch. You can get a thermos container that is made for hot foods that has a folding spoon in the lid. It holds 16 ounces. You fill it with hot water and then dump out the water in the morning, and then put in your hot food. It keeps things hot ALL DAY. You can use that for leftovers, for homemade soups, chili, rice and beans, etc. Add some homemade bread and some fruit or dessert if you want it and you’re good. Since it is too hot for lettuce right now we have been having pasta salad quite often. We also have leftovers on a regular basis for lunch. Lunch for my 7 children and myself usually costs me about .75 to $1.25 total for all 8 of us, or around .10 per person, on average. Then, I usually lay their lunches out at night (while cleaning up dinner dishes). I give them each a few choices for each…protein, fruit, veg, crunchy, and treat. They tend to eat better at lunch if they’ve had a voice, although they regularly say “surprise me”. I pack the items that can sit out overnight and prep the others (like laying out a thermos, etc). This really helps me in the mornings. I am really impressed by how healthy many of these lunches are! I almost didn’t read this post because I thought it would be filled with suggestions for processed, canned foods– you all proved me wrong! several have mentioned water and kids liking it cold. What I do is recycle some old small gatorade bottles. (They are heavier plastic and last longer). Then I fill half way with water and freeze night before. In morning top it off with tap water. By lunch time, most of ice is melted and water is cool, if not cold. 100daysofrealfood.com will save your life. I don’t have kids, but I keep my lunches pretty basic recently. I pack a handful of pumpkin seeds, a yogurt, and leftovers from the night before. Sometimes I throw a piece of fruit in there. Great ideas here. This is my first year packing lunches. So far, we’ve done pb & grape or strawberry jelly sandwiches, salami or bologna and cheese sandwiches, a thermos of milk, a muffin or granola bar, a fruit snack, and fresh peaches or grapes. The muffins and granola bars were made from ingredients on hand, the pb was purchased with coupons and bonus extracare bucks so it was free, the jelly is kept on hand, the sandwich meat was purchased at 28 cents per pack and frozen, the cheese was also picked up on sale, fruit is seasonal, milk is purchased when there’s a mgrs special as is the bread, the fruit snacks were purchased at 50 cents per box after coupons and sales. Lunches haven’t cost any extra. I do want to try some options here as well. My son likes to eat the fruit and sandwich at school and eat his snacks when he gets picked up. I love reading everyone else’s tips and ideas! We always had the option in our house of buying school lunch one day of week but the cost just kept going up plus I didn’t like the food I was seeing on their plates, so 2 years ago, I offered my kids an extra dollar on their allowance every week that they only brought food from home. I figured that I was still coming out way ahead on that deal. Now all 4 of them like home lunches so much that they’d choose them even without the extra cash. I have a high schooler, 2 middle schoolers, and 1 elementary age child. Each school year I make a list of lunch box of ideas and who will eat what. They are allowed to tell me which items they prefer but they have to stay with the same choices for the entire year. I keep this list in a page protector on the side of my fridge for easy reference on hectic mornings. I usually serve a main dish, a fruit or veggie, and some sort of side dish. The main dishes are often wraps or sandwiches but other items I sometimes serve are “cracker stackers” (slices of meat and/or cheese layered between crackers, I stack them all together and wrap in plastic wrap); cooked noodles of any shape with butter and Parmesan cheese; cheese quesadillas; baked beans with a few slices of hot dogs; bean burritos; grilled cheese or ham & cheese; pizza biscuits (biscuit dough topped with a bit of tomato sauce and mozzarella and baked); tuna or egg salad served with crackers; or any leftovers served in a Thermos. Fruit/Veggies are whatever fresh items (or in a pinch, canned or jarred) we have in the house. Side dishes can be popcorn, yogurt, pickles, cheese, crackers, pretzels, homemade trail mix, homemade breads or muffins, or granola bars. Desserts are served on Tuesdays and Fridays. The dessert items are usually homemade cookies, etc. but are sometimes a store bought treat. They all drink water with lunch. Wowzers ours are $2.10! I really don’t know what I spend. My daughter likes soup, cereal, lunch meat or I’ve even packed chicken meatballs. Pretty much anything will work. I had a friend who would cook chicken nuggets & put them in a thermos. By lunch they were still warm, not hot, but warm. I try to save by not buying the prepackaged snacks or food. I will rebag it into lunch portions. We have even made California rolls (sushi) & she has taken that. Anything to mix it up. One thing is we bought 2 of the PackIt brand lunch bags. You freeze the whole bag & it folds down. Keeps the cool things cool for several hours! I have 3 picky eaters and they will not touch the stuff that is served at the school. The food is not even made on site, it is made at the highschool and then transported to the elementary schools throughout the district. Lunch runs from 11-12:30 and the highschool is 20 minutes away. The food is delivered every day around 10:30, so even in warmers, you can imagine how unappetizing it is! I have a shelf in the pantry that has food on it for school lunches. My son usually packs a turkey/cheese sandwich, cheese stick, chips, snack, carrot sticks with ranch and a gogurt. His twin sister has a “uncrustable”, cheese stick, gogurt, chips, green grapes, apple slices, carrot sticks with ranch and purchases a milk for 35 cents. My older daughter has cheese or peanut butter sandwich, cheese stick, apple slices, red grapes, snack, chips and 2 bottles of water (loves water). I work the food into my monthly food budget because if they were home I would have to pay for the food for their lunches anyway. I always try to buy on sale, but I want to make sure they have enough and are not hungry at school. They have to eat anything that would spoil first then have the chips etc last. They also like cold pizza if we have leftovers. For ice water for my girls I bought the “Polar” brand water bottles at any sporting good store. They are insulated with a soft plastic on the outside. I freeze them half full every night and in the am add water. Both of my girls drink the entire bottle during the school day and there is still a chunk of ice in it when they get home. They run about $10. Best investment I have made. I buy the big can of tuna from Sam’s Club and mix it with pickle relish, salt and pepper and a vinagarette salad dressing at the beginning of the week. It stays fresh until Friday. My husband will gladly eat tuna every day. It can also be frozen in smaller servings since there is no mayo. I pack the tuna with saltines for an easy lunch. Add fruit and carrots and maybe some almonds and my husband is a happy man! Due to food coloring allergies (which the school doesn’t make accommodations for!) we send lunches for our kiddos. I purchased each of the big kids a really cool bento-type lunchbox from Lock & Lock. I’ve put soup in those things and they don’t leak! I always stick in a fruit and veggie. Sometimes it’s a couple of strawberries, a handful of grapes, a clementine or even dried fruit. For the veggie it’s grape tomatoes, celery sticks with peanut butter, or those tiny sweet peppers. Then I round it out with crackers or pretzels or baked chips and a sweet thing. The thing I’ve discovered is that I wasted so much food over the years by sending way too much. Watch when the lunchbox is dumped and adjust the amount you send. My son seems to equate lunch with “sandwich,” despite my efforts to expand his horizons. He did not care for the cutesy sandwich rounds at all (which I discovered three quarters of the way through school). A compromise that he has loved is wraps. They are easy to eat and easy to put veggies in! I never bothered with lettuce in a sandwich because it would fall out. I throw in pickles, lettuce, cheese, meat or make a peanut butter jelly, peanut butter banana. First I almost fell over when I say 4.10 for lunch. yikes!!! Last year we were at 2.55 not sure if its going up this year. I will have 2 in full time this year. 2nd grader and kindergarden. both picky eaters! My son is a night mare! they both have thermos. I think my son lived on Pancakes last year! How did you store the pancakes? Were they in the thermos? Was there sauce on them? Did they stay warm? My 8 year old is super picky and has allergies to milk and soy, so lunch prep is a nightmare. She will eat milk/soy free chocolate chip pancakes (plain, no syrup or butter )though!…wondering how to pack so they are appetizing when its lunch time. Thanks:) Ladies, thanks for all the great ideas and responses. This is super helpful! Wow $4.10 for lunch – that’s just insane…. get creative – I am very lucky that my kids will eat just about anything. I make sandwiches and cut them into shapes using cookie cutters, cheese/meat with crackers, fruit kabobs or sometimes veggie, cheese kabobs. I get a lot of inspiration on Pinterest, my kids and I will take a few minutes (yes, set a timer) and look at the picture/ideas and when they are involved suddenly it’s – Mom, can we make that for lunch – not sure your kids ages, mine are a little older 9 and 10…good luck!! I would guess that we spend $10 a week for lunch items specifically, but it’s all part of the regular grocery budget and often lunch is something that we normally have in the house. She is a great fruit/veggie eater, so lunch always includes those – baby carrots, peas (thrown in frozen and thawed by lunch), green beans, broccoli. Fruit is usually apple slices (toss with water/pineapple juice mixture to keep from turning brown), grapes, strawberries, cubed melon, applesauce. I have a fourth grader this year that spends time between her dad’s house (our house) and her mom’s. I pack her lunch everyday, but mom doesn’t, so she has money in her lunch account for the days mom sends her to school. However, I’ve been noticing that my step daughter is still buying the school lunch everyday…so I’m wondering if I’m just not giving her enough food and she’s still hungry-or my hard earned dollars are going straight into the trash and she’s spending her mom’s lunch money? In all of her lunches I pack: juice box, bottle of water, sandwhich (ham and cheese, salami or uncrustable), yogurt, fresh fruit, cup, or pouch, chips, cookies and cheese stick…that’s 5 snacks! She does go to aftercare everyday after school so doesn’t get another snack until 5, but still is that not enough food for a 4th grader? Should we tell her to stop buying double lunches? That seems like a lot of food to me so I have to think that she is eating part of your lunch and part of the bought lunch. Or she is throwing your whole lunch away and just eating the bought one. Depending on the relationship you have with her I would try to sit down and have a conversation with her. From the time I was 1st-6th I could out eat my dad and I was never overweight, think 6th grade 4’5″ and the most I ever weighed was 60 lb’s. I was never hungry for breakfast (in fact if I tried to eat I would throw up) so by lunch time I was starving. The school I grew up in served very nutritous (sp) lunches including an unlimited salad bar. I would typically eat my whole tray of food, go back seconds and thirds on the salad bar. Then at dinner time I could still out eat him even after eating a huge snack (think sandwich plus fruit plus veggies) after school of course we typically didn’t eat dinner until 6:30-7pm. I guess I had a very high metabolism during that time period. So I say all this to just give you an example of she really could be eating all that food and super hungry. I would also take her to the dr and have her checked out. At the beginning of 8th grade I found out I was diabetic, after the dr looked back over my my history…the way I ate, lack of weight gain always feeling hungry, feeling blah when I did eat something sweet. The dr said most likely I had had hypoglocemia (sp) ie low blood sugar problems the entire time but it isn’t something most pediatricians routinely test for. So you might specifically have to ask for it to be done. Have you asked your stepdaughter if she wants a packed lunch or a school lunch? I think giving her a choice might really be a good thing. Maybe all of her friends are buying lunch, and she wants to buy lunch too. I’ll be honest, I often threw my “homemade” lunch away and bought lunch because I wanted to fit in. I don’t think my parents ever asked me what I wanted. Letting her decide what she has for lunch — whether it’s a packed or bought lunch — might be a really good thing for her! thanks for all of the replies! I have this gut feeling that she’s eating all of the snacks, but probably tossing the sandwich and buying lunch. I see how she eats at home-always wants snacks- so that’s more than likely what’s happening. I just checked her lunch account again and yesterday she bought breakfast and lunch! And I fed her pancakes and juice for breakfast yesterday! She comes back to our house on Tuesday so her dad and I will have to talk with her to find out what’s going on. I don’t think it’s health related, but afraid that its bad habits…. We also have purchased divided reusable container to save on having to buy so many plastic baggies. Our regular lunches include homemade pizza lunchables (usuing the Greek pita flatbread from Costco, mozzarella cheese, tomato sauce, and a few slices of pepperoni if I have it), “nachos” (salsa, shredded cheese, and sour cream in a container to dip their tortilla chips in), homemade uncrustables (buy the wonderbread tool at Walmart for cheap, make a whole loaf worth at a time and freeze. If you put them in their lunches frozen they are thawed by lunch time. Don’t forget to make bread crumbs from the crust! ), tortilla rollups (filled with a protein, cheese, veggies and their fav salad dressing), hot dogs (put the hot dog in hot water in a thermos and send the bun separate), leftovers in a thermos, soup in a thermos, homemade lunchables (cheese, crackers, lunchmeat), chef salad (for my kids that will eat it), and a relish tray type lunch (cheese, pickles, olives, crackers). One way we save on cost is to only send a packaged drink every other day. On the off day they get frozen water (I fill their water bottle half full the night before and freeze, then top off with water in the morning so it’s mostly thawed by lunch). I’ve been thinking about this too and got some good ideas. I purchased a divided contain this year that is similar to the easy lunch box. I’m not terribly creative with lunches. Most of the time my daughter gets PB & J. She likes that, but I get bored sending that every day. To “mix it up” I will do CC&J (cream cheese & jelly) or a american cheese sandwich. I don’t put any condiments in that sandwich because she doesn’t like it. Cheese and bread is boring to me, but she likes it. For side items I try to send either a fruit and a vegetable. (Orange, grapes, apple sauce, canned pineapple, cut up carrots or celery) or one of the fruits or vegetable will be replaced with pita chips, corn chips, pretzels in a snack bag, granola bar, pudding cup or trail mix. My daughter’s school requires parents to send a morning snack that is packed separately in a brown lunch bag and I usually send a dry item (chips, pretzels, granola bar, trail mix) and try really hard to send two produce items in her lunch but sometimes I run out of produce by the end of the week. Her lunches are very conventional and I’m not one to do one of those cutesy bento boxes found on pinterest either. My daughter would probably love it. While I cannot commit to doing cutesy lunches every day, I should do it once in a while because it might get her excited about healthy lunches. Once in a while, like twice a year, she will get a school hot lunch. The first time was right before Thanksgiving when we were planning to travel and had nothing to eat in the house and the second time was as a reward for doing something good. School hot lunches are a novelty to her. I’m very lazy with lunches and hate anything that requires too much prep work. The only thing I will chop is vegetables and berries. I never put apples in her lunch because she will not eat them whole, they must be cut and cut apples get brown. I know you can add pineapple juice to cut apples to keep them from browning (lemon juice works too but leaves a sour taste) but I don’t often have pineapple juice on hand. The one inexpensive, convenient, and nutritious item out there–bananas–my daughter rarely eats and that is sort of a pain. I may try the homemade pizza kit with flat-bread like others suggested. I tried that once but the dollar store container with the marinara sauce leaked and made a mess. Maybe the easy lunch box mini dip containers will work better. Just a few ideas! Keep in mind, some schools/teachers are unable or unwilling to microwave your child’s food. Also, often a cafeteria is understaffed, so things that can be easily opened, put together, and eaten are your best bet as a time saver. I usually spend about $15/week on lunches. That price includes Brown Bag Lunch for the Hubby too! We have a great Thermos that keeps things warm for over 5 hours from morning time until my daughter’s lunch time so we often heat up leftover pasta and veggies or whatever from the night before and pack that for her lunch. Very low cost obviously and it’s helped us make sure we don’t throw any leftovers away. We figured since we are heating up leftovers to bring to work, why not for her too?! We also do sandwiches a few days a week to break it up. Usually PB & J, PB & honey, PB & bananas when I get a great deal on bananas, and the usual ham and cheese, etc. If I get a good deal on crackers (sale with coupons that make it less than 99cents for a big box of them), then I make our own “lunchables” with cut up pieces of cheddar cheese, ham, turkey, etc. She loves those. As for sides, we usually pack whatever fruit and veggies are in season (either from our garden which is the cheapest route to go, or from local farmer’s market).